Over the past several years working with Fetish Men San Diego, Doriam has had several requests for Male-Only Parties. Thus far he's helped produce a handful, and now brings you the most recent project, Safe Word. 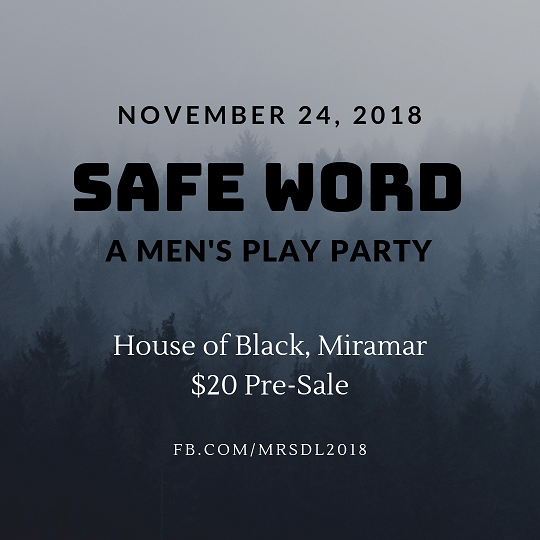 On Saturday, November 24th from 9:00pm to 2:00, Doriam brings you Safe Word, a Men's Only Play Party. 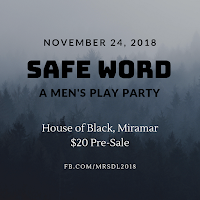 The Party will be hosted at House of Black in Miramar, San Diego, CA near Ballast Point Brewery. This is a private indoor venue with a smoking patio and seven rooms for play (photos below). The exact address will be provided with will-call. Tickets are $20 each until Friday, November 9th via BrownPaperTickets, a secure ticketing website which produces a physical or electronic ticket at your discretion. When registering for your ticket this way, please include your First and Last name for the door list as well as a valid Email Address for any producer messages we may send out. The Party will be held on Saturday, November 24, 2018 from 9:00pm to 2:00am Doors will close at 12:00AM sharp! House of Black is located in Miramar, between the 805 and 15 freeways near Ballast Point Brewery. The Venue is a 3000 sq.ft. fully-equipped dungeon facility with 7 rooms for attendees to play in. Exact address will be provided with in the weeks preceeding the event; please use a valid email address when registering. Interested in Volunteering or have questions? Email MisterSDL2018@GMail.com. Volunteers receive $5 off f their admission for each hour of volunteer work they are available for.